This post is a bit different to my normal ones in that it's not my usual ramblings about something software development related. Instead, it's a cross between a write-up of my taking part in Swimathon 2018, and a side-by-side comparison of how my swim was tracked by 2 different bits of kit: a Samsung Gear Sport and SWIMTAG. For those that sponsored me, this is proof that I held up my side of the deal! :) If you are here for the proof, feel free to scroll down - I won't judge you....much. Swimathon is an event to raise money for 2 very worthwhile charities: Cancer Research UK and Marie Curie. You pick a swimming challenge to complete from 400m, 1.5km, 2.5km or 5km and raise money by getting sponsors. Simple as that. I signed up to complete 1.5km, which I did on Sunday 29th April, 2018. So I researched into swimming - read articles and watched videos on technique, slowed everything down, got my breathing sorted etc. 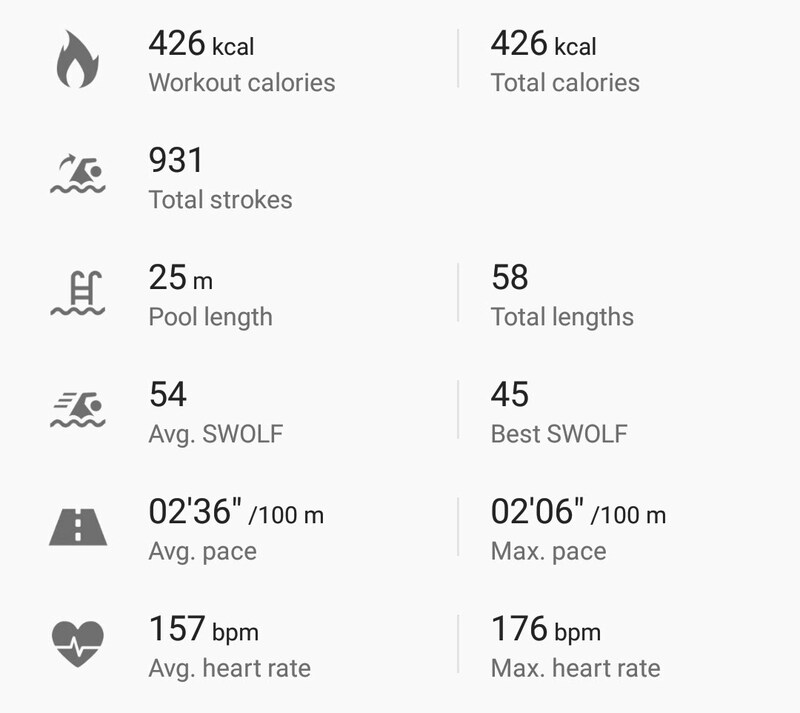 I'm lucky enough to have a local leisure centre that has SWIMTAG. SWIMTAG tracks your swim and gives you insights into your swim - how many lengths, split times, stroke types, DPS (Distance Per Stroke), tracks your PBs, allows you to enter competitions to compete against others locally, nationally or globally. After a swim, the data is sync'd to your account and then available online or via a mobile app. As a Software Developer stat geek, this is right up my street. I like to see my progress as that drives me on to do more and do better - I'm one for continual improvement and SWIMTAG has been a big part of that. Soon I was making progress; my times were dropping, my distances were increasing. And 9 months after picking up my knee injury, I was also able to get back to running. #Winning! The Gear Sport is, for me, a great option if you want a watch that has a good combination of smartwatch functionality crossed with fitness tracking. SWIMTAG is dedicated to swim tracking so I'd expect that to be more accurate. In previous swims where I wore one or the other, but not both at the same time, they seemed on a par in terms of accuracy of tracking lengths and stroke types. Both missed the odd length at times. But one huge advantage of the Samsung Gear Sport is the fact it has a visual display, plus can give you feedback via vibration every x lengths - if you're like me and get distracted by thinking about what's for lunch halfway down a length and lose your count, this is a very useful feature. The Samsung display, as you'd expect, is awesome, though I would like a slightly stronger vibration and sometimes during a swim you might not always feel it. 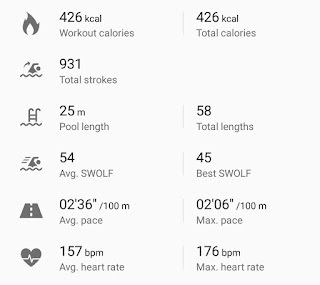 There are a few apps you can install to track swims - I used the one as part of Samsung Health, as personally I liked all my fitness activity activity going into one place. I have also tried the Speedo app briefly in the past, which would be another option. did not track the lengths correctly - it went wonky twice, missing 2 lengths in total. I found this weird, as both times, I'd paused at the end for 5 seconds to let someone pass so it should have been easier if anything, to detect the end of a length. 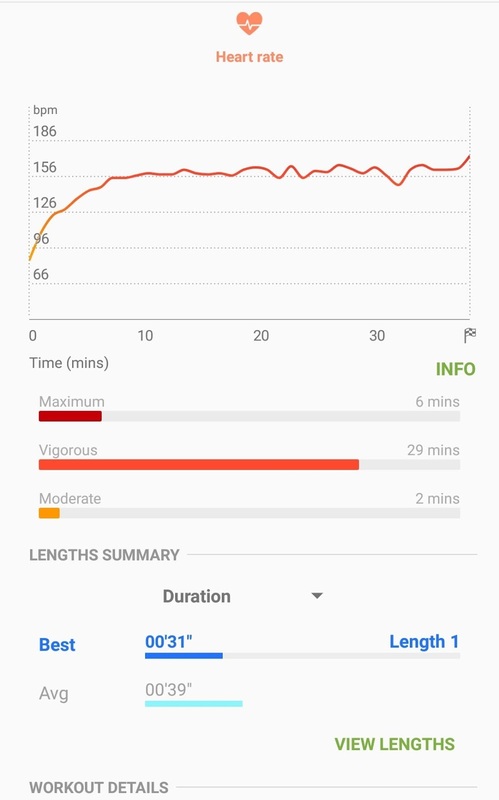 This shows up in the breakdown you get in Samsung Health as 2 length times are about double the rest. The Samsung Gear Sport is a great watch. For those that want the best fitness tracker, I'm sure there are better options that are more fitness focused. In terms of swimming, I was disappointed that it didn't track the full swim accurately. Usually, a brief pause at each end is enough for the tracking to be spot on. Perhaps the Speedo app would have performed differently - unfortunately, I couldn't track in both apps at the same time. For me, SWIMTAG is my primary source of tracking. As a dedicated swim tracker, I like having all my history in there with PBs tracked, competition leagues and a sense that it should be the most accurate. 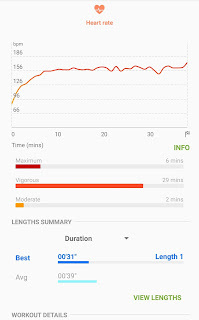 I like the Gear Sport as a secondary tracker - much better for feedback while you're swimming as opposed to SWIMTAG which is only helpful post-swim. I had a couple of questions from someone who forked the project on GitHub and is using it as the basis for their own custom dashboard, which reminded me that there are a few key things I picked up on my learning journey that I should share. These are primarily focused around SignalR aspects. A single instance is not shared across all clients connected to that hub. This is much like a controller in ASP.NET MVC, whereby a new instance of the controller is created for each request. Hence in my SignalRDashboard project, the mechanism for holding a single instance of shared data for all connections, is via a singleton instance that gets passed into each hub's constructor. The basics are covered well in the official SignalR site, but the points above were some of the main things that I found myself looking a bit deeper for. However, dm_exec_text_query_plan also returned NULL for the plan handle so it was a dead end for this scenario. So, a bit more digging around and came across this question on StackOverflow. This was pretty much the scenario I was experiencing - my stored procedure had a conditional statement that wasn't being hit based on the parameters I was supplying to the stored procedure. I temporarily removed the IF condition, ran it again and hey presto, this time an execution plan WAS returned. Re-instating the condition then, sure enough, made it no longer return the plan via `dm_exec_query_plan`. I tried to create a simplified procedure to reproduce it, with multiple conditions inside that weren't all hit, but a query plan was successfully returned when I tested it - so it wasn't as straight forward as just having multiple branches within a procedure. This was pretty much exactly the scenario I was hitting. I carried on with my ultra-simplified repro example which shows the full scope/impact of this issue (see below). As noted in the forum post provided above, it's an issue that occurs when using a temp table in this context, but table variables do NOT result in the same behaviour (i.e. testing a switch over to a table variable instead of a temp table sure enough did result in query plan being returned by dm_exec_query_plan ). N.B. It goes without saying, this is not an endorsement for just blindly switching to table variables! --    usecounts is now 2. -- 9) Check the plan cache again - query plan is returned and usecounts=1. Last week I passed the 70-486 Microsoft exam - Developing ASP.NET MVC 4 Web Applications, so thought I'd knock up a quick post on my experience and what materials I found useful as part of my preparation. Going into this exam, I had just over a year and a half's commercial experience using ASP.NET MVC 2 & 3. Before that, I had experience in ASP.NET and prior to that, when dinosaurs still roamed, classic ASP. It's no secret I'm a bit of a data nerd (a lot of my blog is db related, SQL Server, MongoDB...) and I have tended to be backend focused, but I wanted to even out the balance a bit by pushing myself in this area, and in JS/HTML5/CSS3. I took the opportunity to upgrade the web solution at my current company from MVC 3 to MVC 4, and being able to do that at the start of my preparation was really useful - this is how I like to learn, by actually "getting stuff done". That is the obvious, number 1 recommendation - do not just read and swot up on the theory, actually "do". My brain likes me to be stupid and make practical mistakes - when I then work out how I've done something daft, it reinforces the learning and makes the knowledge stick. The first thing I was disappointed to find was that there is (as of time of writing) no Microsoft Exam prep book for this exam. There is one due out I believe at the beginning of October 2013 - Exam Ref 70-486 : Developing ASP.NET MVC 4 Web Applications by William Penberthy (ISBN-10: 0735677220 | ISBN-13: 978-0735677227). So I obviously can't comment on how good that book is. The book I went with was Professional ASP.NET MVC 4 from Wrox, by Jon Galloway (Twitter), Phil Haack (Twitter), K. Scott Allen (Twitter) and foreword by Scott Hanselman (Twitter). While the book alone isn't enough for the exam, for me it gave a good coverage on quite a few areas I needed so it is definitely worth a read. Having a Pluralsight subscription was good and while not necessarily geared towards the exam, you can never go wrong with a bit of Pluralsight training. I went through a number of the MVC courses - ASP.NET MVC Fundamentals, ASP.NET MVC 2.0 Fundamentals, MVC 4 Fundamentals and Building Applications with MVC 4. One of the things I like about Pluralsight is you can control the playback speed so for most of the stuff I already knew, I glossed over at a faster speed. I also went through the "Building Web Apps with ASP.NET Jump Start" training on the Microsoft Virtual Academy (Scott Hanselman, Jon Galloway and Damian Edwards (Twitter)) - that was quite entertaining! These give a lot of useful links to MSDN articles, MS resources, blogs, interesting StackOverflow questions etc. Last but definitely not least, there was my practical setup - Windows 8 on a VM, with Visual Studio 2012 and a Windows Azure account. To re-iterate what I said before - the best way to learn, is to do...and make daft mistakes. I started work on a new web app from scratch, with a real-world mindset on (i.e. writing production-worthy code) putting to good use the new things I was learning. I also had a scratch-pad web app where I would just dump rough code to try out short, simple snippets. Overall, I put a lot of time and effort into preparation for this exam and it paid off. The biggest benefit for me is what I learned along the way and the challenge it gave me. I wasn't initially sure what that related to - I hadn't specified that account during the upgrade process so I went looking in the Services managemement console. The SQL Server service for the instance I was upgrading was configured to "Log On As" that account and it had been happily running prior to the upgrade. This domain account did exist but to sanity check, the first thing I did was switched the service to use another domain account that also definitely existed and retried the Repair process. Same error. Then I spotted further down the list, another service had specified an account in the "somedomain\someuser" form. So I switched the SQL Server instance service to specify the account in that form (Down-Level Logon Name) instead of the UPN (User Principal Name) format (reference). While I was waiting for the Repair process to run through again, I carried on searching and found this question on the MSDN Forums. The very last answer there confirmed it. The SQL Server 2008 R2 upgrade does NOT like user accounts in the UPN format. I've started knocking together a little app to automate the process of trawling through a folder structure and checking .NET project files (C# .csproj currently) to extract some info out of them. The DotNetProjectFileAnalyser repo is up on GitHub. I've been working against Visual Studio 2010 project files, but could well work for other versions assuming the project file structure is the same for the elements it currently looks at - I just haven't tried as yet. Build output directory (relative and absolute) for the configuration/platform specified (e.g. Debug AnyCpu). Useful if you want find which projects you need to change to build to a central/common build directory. More stuff will go in over time, with ability to automatically update csproj files as well to save a lot of manual effort.